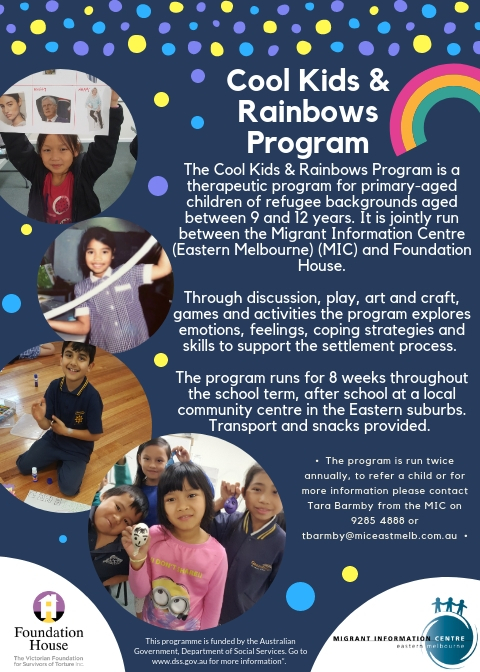 The Cool Kids & Rainbows Program is a therapeutic program for primary-school aged children of refugee backgrounds aged between 9 and 12 years. It is jointly run by the Migrant Information Centre (Eastern Melbourne) (MIC) and Foundation House. The Cool Kids Program has been developed with a recognition of the challenges that children from refugee backgrounds often face as they integrate into Australian life. The program assists children from refugee backgrounds in developing life skills to assist them as they go through the resettlement process. The program uses discussion, play, role-plays, art, games and activities to explore emotions and feelings and to develop day-to-day coping strategies and social skills to live confidently and happily in a new environment. The combined skill sets of the MIC Settlement Worker and the Foundation House Counsellor Advocate allow the children’s emotions, feelings, past and current experiences to be explored in a safe and supportive environment. The program runs weekly over an 8 week period for approximately 1.5 hours in a local community centre. A MIC staff member and volunteer pick children from their respective schools, transport them to the program and drop them home at the conclusion of the program. For further information, please call Tara Barmby on 9285 4888. Where is Central Ringwood Community Centre?